I’ve been thinking a lot about story settings lately. Building a setting, I think, is nearly as much fun as creating characters and a storyline. With each Madison Creek story, the lakeside Michigan town grows with more details, such as the park down near the end of Main Street where everyone gathers for events and festivals. It’s near the city hall buildings, and you can see the lake from the gazebo. Or the view of Main Street that now has a flourishing business in nearly every storefront. I’ve loved watching this town grow and have needed to create a somewhat messy map to keep up with everything. I included a picture below, those it’s not the greatest. This week, I’ve been working on revising my Kindle World Sweet Grove stories. As you may have heard, Kindle Worlds closed down and now we’ve been given our book rights back. I really enjoyed writing Love’s Mercy and Love’s Harmony and wished to keep the Lavender Vales Farm series going. So I needed to revise both books, setting them in a new town with new businesses. Thus, Thistle, Texas has come into existance, settled in the Hill Country somewhere between Fredricksburg and Austin. I began seeing one of those one street Texas towns that’s surrounded by miles and miles of country. You might find a couple of off streets with a few businesses and a lot of churches. Sometimes more churches than anything else in some towns. In Thistle, there’s a restaurant called the Tilting Pancake that serves meals all day but is famous (far as small mom and pop restaurants go) for their buttermilk and fruit pancakes. Thistle, it turns out is also where Haley Madison’s sister, Lexie Hamilton, is from. Small world, isn’t it? ha. But it gets better because there’s a new series developing in my crazy mind that takes place about fifteen miles from Thistle (The new location of Faye and Chase’s Lavender Vale Farm) that will be the setting for a new series called Tinkertown Texas. And oh boy, wait until you hear about Tinkertown. I’m going to have a lot of fun with that place… but I’m getting ahead of myself and I don’t want to give away any surprises. I also create fantasy worlds– if you didn’t know, I also write inspirational fantasy stories, but you’d need to visit my website to read more about that if it sounds interesting. World building is something I really enjoy doing. What I’ve learned, is that building a strong setting is just as important as building interesting characters. I take a lot of time when creating places where my stories take place. I draw maps. Not great maps, but they work for me. Ha. I develope towns, businesses, landforms, ect. I usually start doing that before, if not while developing my characters and outlines. It’s fun. Like when I was a little kid playing with my plastic farm or wild animal packets. You know those bags of plastic figures you could buy at the grocery store for real cheap? I’d want to hurry home and race out into the backyard where I’d spend hours building homes for those little animals out of sticks, rocks, and dirt. So much fun. I’ve not grown up all that much if you can’t tell. I still enjoy building places and worlds for my little character figures. So, how about you? Where do you enjoy having stories set? A beach resort? A big bustling city? A small rural town? I’ll enjoy hearing your thoughts on this matter. Perhaps there’s a special place you once read about that has stuck with you? Care to share where that place is? And come to visit my website when you get a chance to find out about the story worlds being built there. More from Madison Creek and Lavender Vale Farm will be included soon. www.jackiecastle.com – hope to see you around my Story World. Hi Jackie, I can see how having a map would be useful- necessary!! I have never thought of the complexity of building setting- especially a fictitious setting. It would be fun to create, to put all ones favourite things into a setting. I enjoy stories set in a variety of places- I appreciate the small town, where everyone knows each other, but also the city with lots of opportunities for action. Arcadia Valley and Tuscany have occupied/are occupying my thoughts/memory recently. I’ve always lived in a city and should probably write more books set there. But I’d love to live in a country area, so I guess I’ll go there in my imagination. lol. 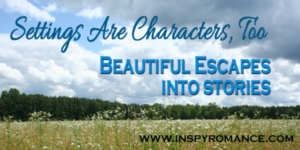 I completely agree with you about the setting being as important as the story and characters! I like small towns, in the mountains, on a lake, over looking a river, or at the beach, doesn’t matter – just a small town! I fell in law be with Bridgeview in Valerie Comer’s Urban Farm Fresh Romance series!! Fell in love with, not law, lol, fat finger typing! Hi Jackie! Thanks for the insightful blog on creating interesting and unique settings. As a Michigander, I enjoy your Madison Creek stories with the small town setting near a bigger real city. I think that gives credibility to the fictionous setting. I also enjoy stories set in a variety of places around the world – both small town and major metropolitan areas. The Tuscan Legacy series was unique because while the main setting was Tuscany, the reader traveled the world (USA, Great Britain, Italy). As a reader, I sometimes wish authors would write stories set in lesser known states or places. Best wishes in developing new settings. I visited Ludington last time we visited Michigan and got a lot of inspiration for Madison Creek from there. It’s North of Muskegon. What a pretty little town right off the lake. Hi Jackie, I loved hearing about your small-town settings and seeing your map. I wish I were better at creating settings beforehand; they tend grow haphazardly as I write, and then I’m faced with trying to do a map based on that. Wish I could find a wonderful mapmaker to draw my maps for me… any ideas? I’m not above using real maps for inspiration. lol. A lot of time I use the road layout of one town, and businesses from another for ideas. I also keep tourist maps of places I visit. They’re great resources for fictional towns. I enjoy drawing, and I use Photoshop for my fantasy maps. For me, it’s just easier to grab a ruler and pencil for real towns. I love maps and floor plans! I’ve drawn floor plans since I was a kid, and there have been plenty of unbuilt dream houses as an adult, too! Now I design them for my characters. Maps, too. It helps me keep where certain things are, like the dining room, stairs, ect. Pinterest has a lot of house plans that I’ve used as inspiration for the Victorian B&B. I need the visual when writing to keep everything in place. But when I’m reading someone else’s book, then like you, I find it fun to check the map, too. I love your contemporary stories. My ideal setting is a small town,like where I grew up in Texas. My father was a wanderer so we usually only spent a few months a year in our hometown. I have seen and lived in many places but I always love small town America. My next two series will take place in Texas. Since I live here, I thought it’ll be easier to draw on places I’ve visited. Your map is wonderful, Jackie! Wish I could draw that well! 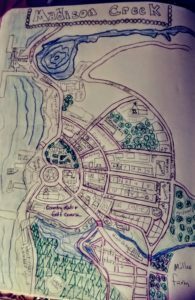 I need to do maps for each of my two small-town series settings. They grow and get more detailed with every book. Hi Jackie. I love stories set in small towns. Texas Hill country is one of my favorites since we have family in that area and visit every year or so. I would say that I prefer stories set in a big city over a small town but the story and the characters drawing me in is more important than the setting. It’s been awhile since you wrote this… I’ve been on a trip and haven’t had time or energy to read all my email. I’d love to be able to get a larger copy of that map of Madison Creek so I can have it in mind when I read your books! !